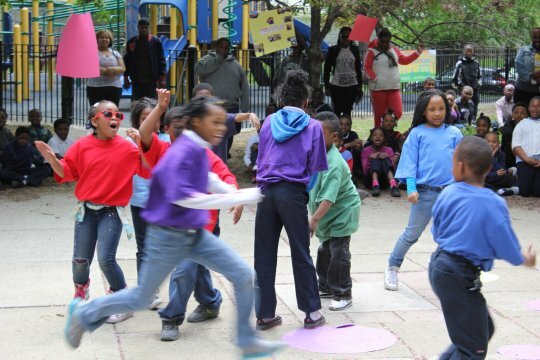 Chicago Arts Partnerships in Education (CAPE) recently joined the National Young Audiences Arts for Learning network. Below are impressions of CAPE from their current Development and Marketing Associate, Michelle Green. I first learned about Chicago Arts Partnerships in Education (CAPE) while I was researching my Art Education Masters thesis at the School of the Art Institute of Chicago. What was this organization that integrated the arts into everyday classrooms? That was dedicated to long-term partnerships and professional development for teachers and artists? That conducted qualitative and quantitative research on their programs? I had to hear more, so I contacted CAPE to schedule a chat with a few staff members. Less than ten minutes into my conversation with founding director Arnold Aprill, I was being introduced to the rest of the staff and briefed on opportunities to volunteer. I started a week later, loved every minute of it, and eventually joined the staff full time. CAPE students perform for family and friends at Williams Elementary. My first in-school experience with CAPE was in May 2011. As a brand new research assistant, I was helping to record the first round of three annual research interviews at Locke Elementary, for a three-year project with 6th-8th graders at six of Chicago’s International Baccalaureate schools. I was fascinated by the researcher’s questions and the conversational style of the interview. Even students who were shy or nervous were able to explain not only the project's fun moments, but the math, science, or history that they’d picked up along the way. In May 2012, I was back at Locke, except this time I was the one conducting the interviews. After their second year of the project, the students were able to explain to me not just how fun the work was, and not just the academic facts they’d learned, but how the art and the academics connected to their own everyday lives. That was exciting progress! Then, just yesterday, I was back out at that same school, simply sitting in on the same students’ third and final research interview. These students, now in 8th grade, said the same things as the year before, and then went further. After this third year of the project, the students were able to articulate the value of learning academic subjects through arts integration and how they connect their arts-integrated learning to their futures and the wider world. I couldn’t have been more impressed by those students and the growth they exhibited across this three year program. A CAPE students leads a workshop on shadow puppets at Telpochcalli Elementary. During these past three years, I have watched CAPE grow impressively. We’ve expanded programs, and we count 143 teachers, 62 professional teaching artists, 50 Chicago Public Schools, and 4300 K-12 students as CAPE partners. Some of our teachers and artists have been working together for over 15 years, and some of our students have participated in as many as 8 continuous years of CAPE programs. We are deeply committed to challenging and supporting our teachers and artists to collaborate and design innovative curricula, and every year, our teaching partners continue to create rich classroom units and authentic assessment tools that inspire not only their peers, but the CAPE staff as well. I love being part of an organization that is driven by curiosity and passion. My favorite thing about CAPE is the foundational belief that inquiry, exploration, creating, documentation, analysis, and reflection are integral to teaching, learning, growing, and getting better at what we do, in the classroom and out in the world. We at CAPE couldn’t be more excited to join the Young Audiences Arts for Learning network that is as committed as we are to impacting arts education practices and policies across the country! Contributed by Michelle Green, Development and Marketing Associate, CAPE. CAPE students at Goudy Elementary use iPads to record a video about bullies.